Beach pajamas [aka pyjamas]; detail from Delineator cover, August 1933. Delineator, June 1933, p. 61. “Bermuda” is the name given to this dress (Butterick 5025) which, like tennis dress No. 5182, buttons down the back. 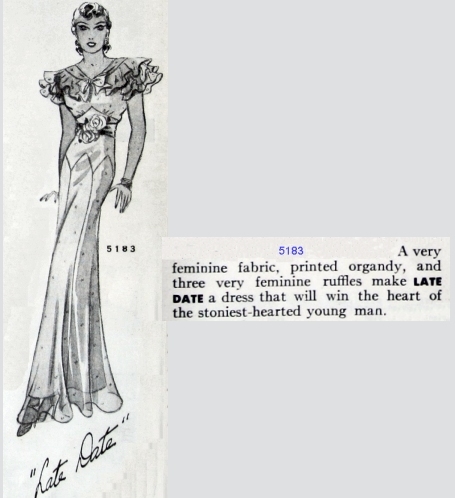 “…Known technically as a beach dress although it is far more apt to be worn off the beach than on.” Delineator, April 1933. Notice the bare backs and chic suntans of these blonde models. “Hello Everybody” is the name given to Butterick 5021, at right. From Delineator, April 1933. Clothes for bike riding and skating, Delineator, June 1933. Butterick 5219 could be made as trousers or shorts. Delineator, July, 1933. The Talon fastener — a slide fastener or “zipper” — was still new in 1933; many dressmakers would not know how to install one. Butterick slacks pattern 4884 had a sailor influence in its double row of buttons. The shirt pattern was included. Left, Butterick 4884 photographed for Delineator in June, 1934. The reclining model wears Butterick 5219. Slacks pattern 5219 (“Eight Bells”) pictured with a bathing suit, 5215 (“Seawothy.”) Delineator, July 1933, p. 60. You could earn a pair of skates like this by selling subscriptions to Ladies’ Home Journal. Ad from LHJ, August 1936. My skates could only be used with leather-soled shoes; the clamp at the front was adjusted with a “skate key,” but slipped off of tennis shoes. The Pretty and the Kitsch blog happened to show this photo of women roller skating in trousers (like Butterick 4884 or 5219) or beach pajamas. The photo is not dated precisely, but it’s apt! Thanks, Emily Kitsch. “Don’t get a wool jersey bathing suit — the wool suit isn’t enjoying its usual popularity. The rubber bathing suit and the cotton ones are making it look sick.” Marian Corey, Delineator, June 1933. p. 61. Wool bathing suits in an ad for Ironized Yeast, Delineator, March 1933. Wet wool bathing suits, late 1920’s or early 1930’s. All (well, nearly all) is revealed as the weight of the cold water pulls the knit suits tight against the body. This cotton bathing suit was designed by Orry-Kelly for Bette Davis, seen wearing it. 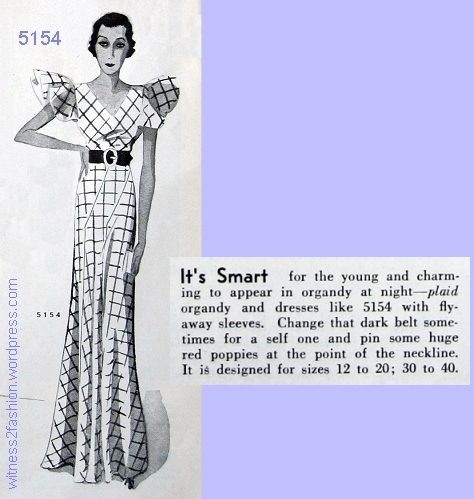 Butterick briefly offered line-for-line copies of clothing worn in the movies, as “starred patterns.” This one is from June, 1933; Delineator. Marian Corey recommended cotton bathing suits, like this one, Butterick pattern 5215. June 1933. Two versions of Butterick bathing suit 5215, from July and June, 1933. “Jersey tights” were worn under the skirt or shorts. 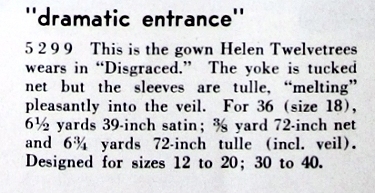 Butterick 5173, a dress with a drawstring neckline; Delineator, June 1933, p. 62. Rubber bathing suit pictured in McCall’s Magazine, July 1938. Gingham beach pajamas and bare shouldered sundress. Butterick 5133 and 5075 , Delineator, May 1933. In “Gingham Girl” one can crawl about on hands and knees and get in the way of the garden hose without any harm being done. “Gingham Girl ” takes housework in its stride, too, doing away with bulky and unattractive aprons.” “New Low” is the thing for tennis, for there’s nothing to hinder the most smashing serve.” — Delineator, May 1933, p. 52. Now I’m ready for July. 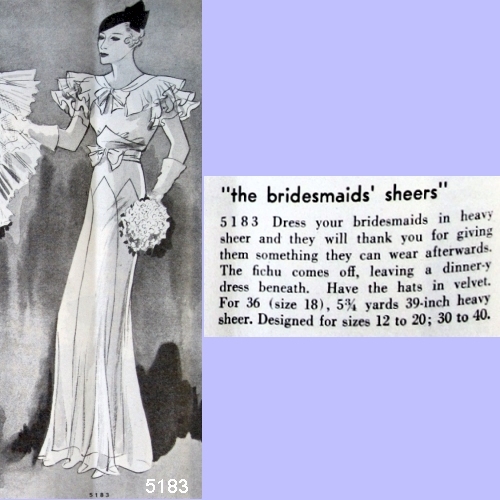 Butterick 5437, December 1933. Delineator. Back in the nineteen nineties Donna Karan realized that, as women age, some become reluctant to bare their necks, or their upper arms, or their chests. Yet, for women, formal evening dress usually requires some bare skin. Karan cleverly exposed the shoulders! Shoulders rarely get wrinkled or flabby, and their skin never sags. 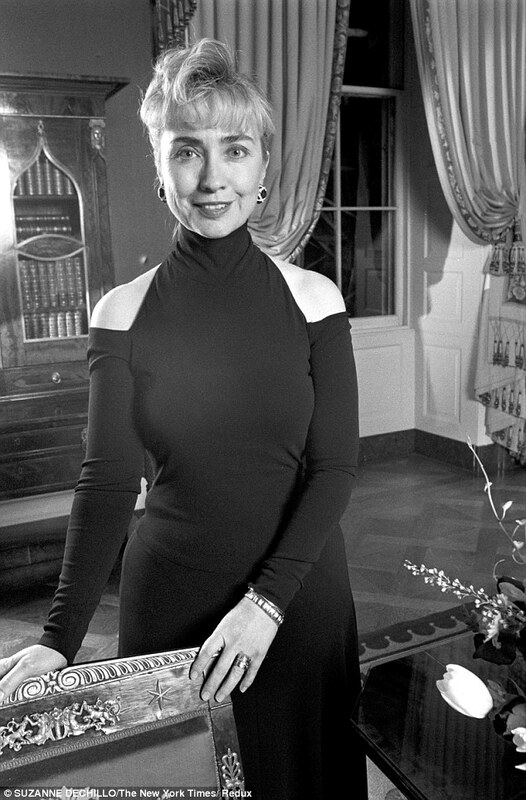 Click here for the “cold shoulders” dress as worn by then First Lady Hillary Clinton in 1993. Versions were also worn by Barbra Streisand and Liza Minelli. Those Karan bare shoulders are back now: click here. In 2017 they have worked their way into Bloomingdales, Macy’s, and even children’s clothing. But Donna Karan wasn’t the first to show bare shoulders, by sixty — or ninety — years. Film designer Howard Greer created a bare-shouldered dress for Katherine Hepburn in Christopher Strong, 1933. 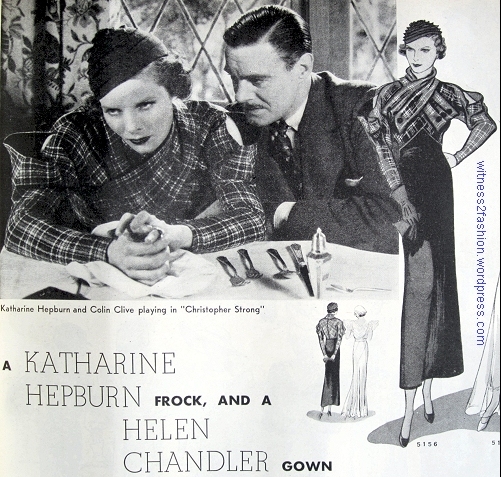 Katharine Hepburn’s bare-shouldered dress, designed by Howard Greer for the film Christopher Strong, was available as a Butterick “starred” pattern in May, 1933. Delineator. 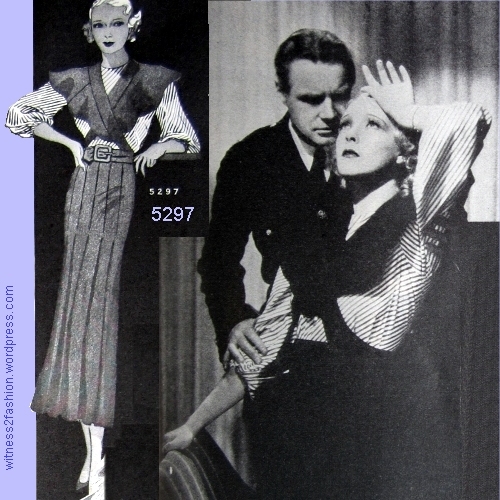 Butterick 5156 was a faithful copy of this 1933 movie costume. 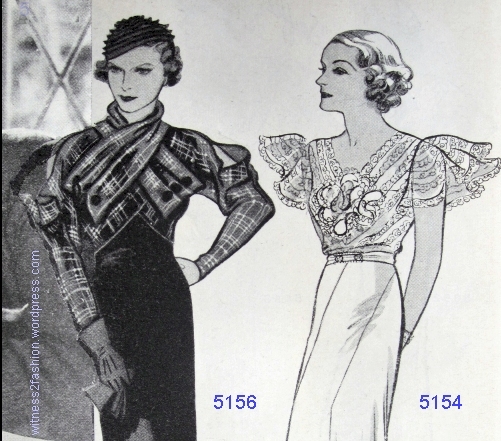 In the 1930’s, patterns that had bare shoulders — or slit sleeves that revealed bare upper arms — were available. Butterick 5437 and Butterick 4944. Right, Butterick evening dress pattern 5530. On the left, Butterick 5518. From 1934; Delineator. 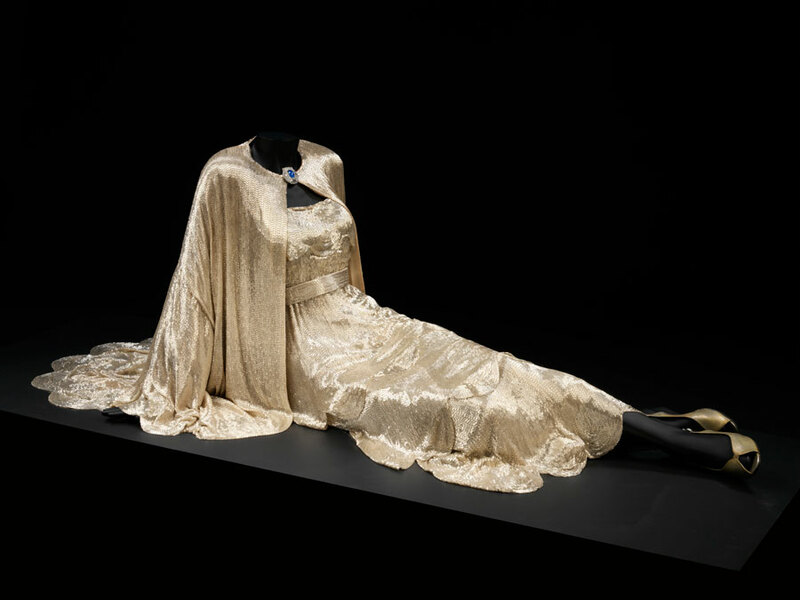 From 1935, this gown for a young woman echoes the evening gowns of an earlier era. Evening gown from the House of Worth, 1906-1908. Metropolitan Museum Collection. Robe de Style, Jeanne Lanvin, 1926. Collection of the Metropolitan Museum. It’s hard to see any resemblance between this gown and Butterick 6061. The bare shoulders of Butterick 6061 can be seen in 2017: click here. 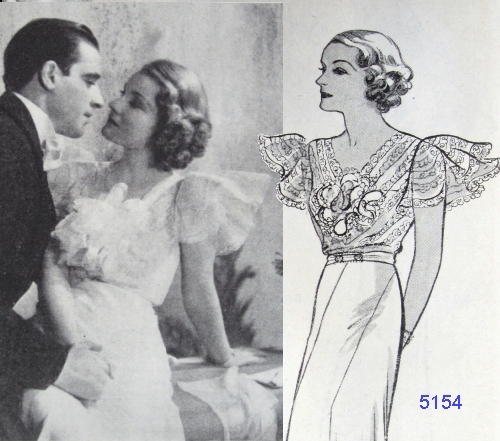 Butterick 5415, a “cold shoulders” nightgown from December 1933. Delineator, p. 60. It’s more fun than getting pajamas for Christmas. Although the face looks like a Shirley Temple Doll, this pattern said it was a for a “Movie doll.” McCall pattern 418, from a 1946 catalog, but probably issued years earlier. McCall “Little Lady” doll clothes pattern 1015, from a 1946 catalog, but probably earlier. 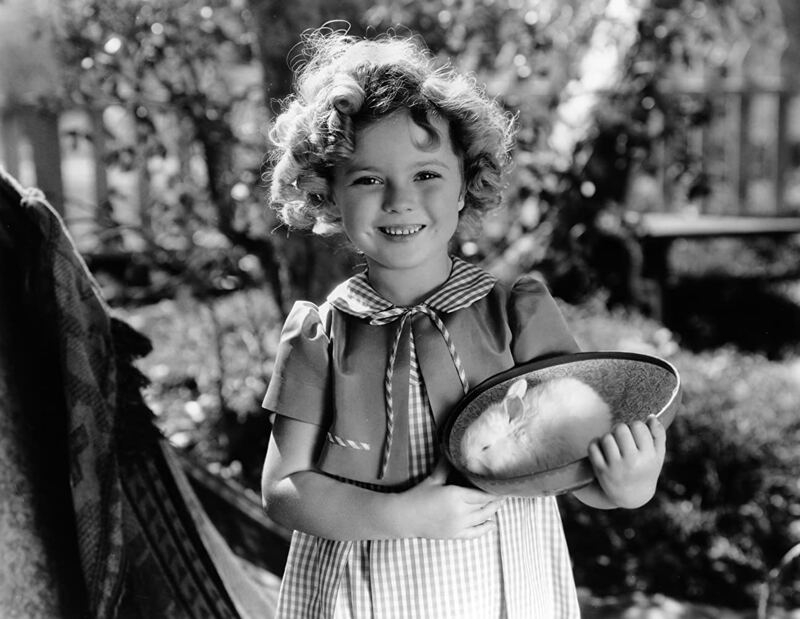 Singing, dancing Shirley Temple was a big star (and a movie veteran) by the time she was eight. Shirley Temple in an ad for the film Baby Take a Bow, 1934. She was five or six at this time. 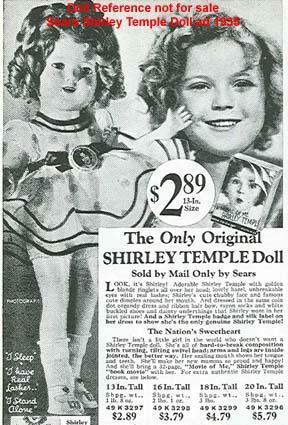 You could get a free 13 inch Shirley Temple Doll by selling four subscriptions to Ladies’ Home Journal. Ad, January 1936, LHJ. Shirley Temple dolls, made by Ideal, came in many sizes; after their successful debut in 1934, pattern companies wanted to cash in on their popularity by selling patterns for doll clothes that would fit the dolls, and which could be related to little Shirley’s movie roles. However, because of licensing agreements, most companies didn’t have the right to use the Shirley Temple name. DuBarry doll wardrobe pattern 2144B, from 1939. Vintage doll enthusiasts usually refer to this as a Shirley Temple pattern — for obvious reasons. This DuBarry pattern, which dates from 1939, shows dolls with the Shirley Temple face and hairstyle, but does not use her name. Text from DuBarry envelope, pattern 2144B, 1939. The pattern was available in 6 sizes, depending on the height of the doll. Simplicity 2243 also said it would fit “popular film star dolls.” McCall 41435 from 1937 is usually described online as a Shirley Temple pattern, but those words aren’t used on the envelope. McCall “Movie” doll pattern 525 had a hooded cape, as well as beach pajamas and hats. Shirley Temple in Heidi, 1937. Her “peasant girl” movie dress laced up the front. 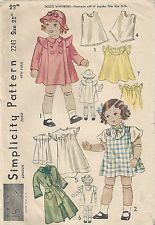 These McCall “Movie” doll patterns (525) seem inspired by Shirley Temple’s Heidi costumes, which probably influenced dresses for other little girls. I love this beach pajama outfit; beside it is a photo of a little girl who lived next door to my grandmother. McCall’s Movie doll pattern 525 for beach pajamas was the same design as a 1937 play outfit for girls in the CoPA collection; right, unidentified girl wearing a similarly bias-trimmed outfit. California circa 1930s. Clothes for these dolls resembled real clothing for children, as seen in the dress, green coat and suit from McCall 418, below. Part of McCall 418, “Movie” doll wardrobe; in December 1946 catalog, but the number sequence puts it earlier. McCall “Movie” doll pattern 418. The face is Shirley Temple’s. Detail, McCall “Little Lady” doll wardrobe 1015, from a December 1946 catalog, but probably earlier. I wore a suit like that, myself, in the late 1940’s. Little girl in a suit similar to the Movie Doll patterns. Late 1940’s. Butterick doll wardrobe pattern 449, from December 1937 Butterick Fashion News flyer. 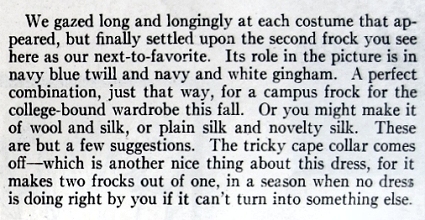 These wardrobes often included underwear, dresses, a coat or cape, and pajamas or a jumpsuit; the detailed robe in Butterick 449 delights me. Details from Butterick 449. Butterick Fashion News, December 1937. McCall pattern 1015 reflected World War II women’s styles, including a “siren suit” (is that an air raid warden’s insignia?) and a Red Cross Nurse. Detail from McCall 1015. A “siren suit” or coverall for wearing during air raids or war work, and a nurse’s uniform. Suitable for “Little Lady” and similar dolls, 13.5 to 22 inches high. 1946 catalog, but probably earlier; Little Lady dolls appeared in 1942. McCall 918 pattern for “Movie dolls” and “Little Lady” dolls. 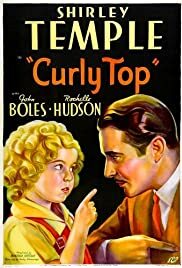 Perhaps the movie inspiration for this one was Gone with the Wind (1939,) rather than Shirley Temple. Southern Belle ball dress and cape from McCall Movie doll pattern 918; from 1946 catalog, but probably earlier. I especially like the doll’s “broomstick skirt,” a fad for women’s skirts that were twisted and tied around a broomstick while wet, so that they were random pleated when dry. Long housecoat and broomstick skirt with blouse, McCall Movie doll pattern 918. Allowing for the child-shape of the dolls, these mimicked women’s clothes. I remember my mother wearing a blue 1940’s housecoat very much like that one! 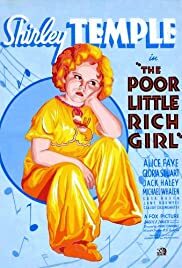 Shirley Temple’s heyday as a child star was in the mid 1930’s; although doll-buying parents might have fond memories of her as Dimples, The Little Colonel, Curly Top, and other roles she played before she was eleven, by 1947 she was a married woman, playing opposite Cary Grant and Myrna Loy in The Bachelor and the Bobby-Soxer. Butterick doll wardrobe patterns 5969 and 5968. December 1951, Butterick Fashion News. Butterick 5969 was for the new “Toni” doll, which allowed you to wash and set her hair. The Toni home permanent company realized (or hoped) that little girls might like to give their dolls a “Toni.” In fact, the setting lotion for the Toni dolls’ hair was sugar and water. I can say from my own childhood experience that my Toni doll’s hair developed a sort of sugar dandruff — luckily you could shampoo her hair, too. However, Shirley Temple dolls did not disappear; in fact, perhaps because her old movies were appearing on television in the fifties, a new, improved Shirley Temple doll was released in 1958, and new doll wardrobe patterns for her — in fifties’ styles — quickly appeared. Advance doll pattern 8813, released in 1958. From Blueprints of Fashion 1950s, by Wade Laboissionere. The Advance company was licensed to sell Shirley Temple Doll patterns, but I suspect that other companies were able to work around that problem — again. Click here to see a Simplicity Shirley Temple doll pattern dated 1979. Unlike many child stars, Shirley Temple Black led a happy and productive life “after Hollywood,” and served as a United States Ambassador to Ghana and Czechoslovakia. Many of these movie doll patterns can be seen (or purchased) at Old Doll Patterns. 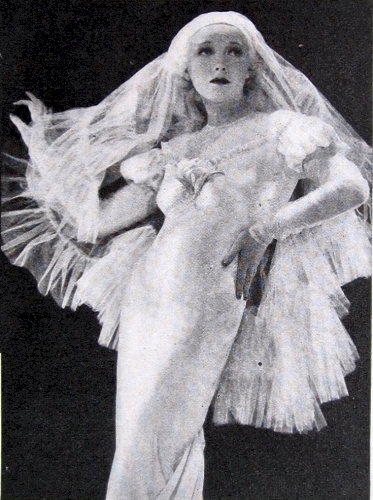 The wedding dress designed for a movie by Travis Banton as part of Butterick’s Starred Patterns series (August 1933) appeared in The Delineator again the very next month, with no mention of Travis Banton as its designer. This time, it was the centerpiece in a “Church Wedding” feature. 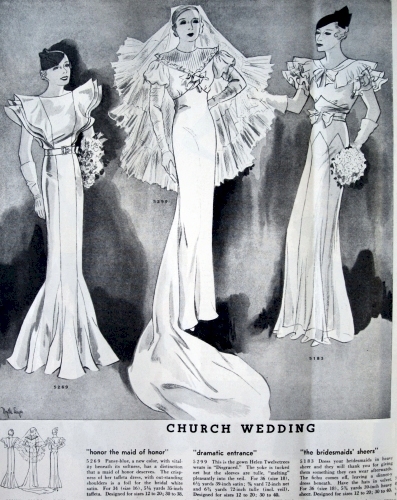 “Church Wedding,” Delineator, September 1933, p. 64. From left, patterns 5269, 5299, 5183. Myrtle Lages illustration. 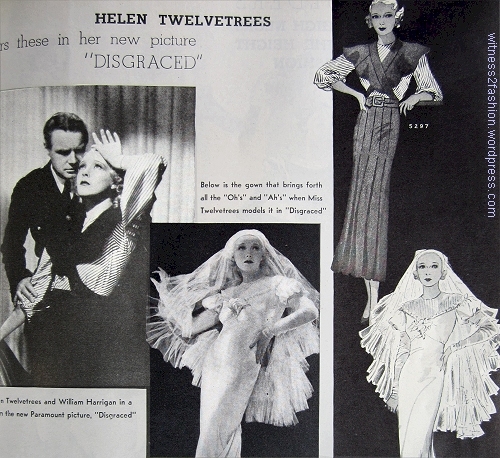 Helen Twelvetrees in Travis Banton’s wedding dress design, from the movie Disgraced. Delineator, August, 1933. The pin-tucked yoke and the sleeves are the same sheer fabric as the veil; the dress is satin. 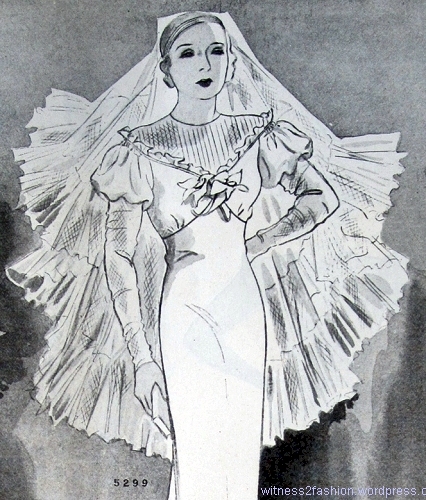 Butterick wedding gown 5299, described in Delineator, Sept. 1933 issue. The Maid of Honor’s dress, No. 5269, was illustrated before, in August, and given the name “Wings.” Like many dresses for a wedding party, it was also a normal party dress — and shown on a much younger model. 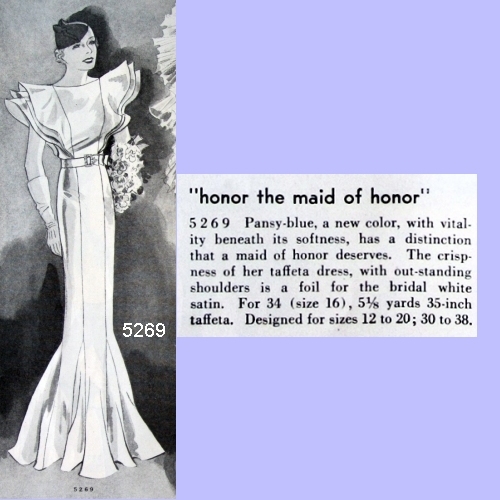 5269: This “Maid of Honor” dress from September was a party dress for the bride’s trousseau in August. Delineator. 1933. “From the [bride’s] trousseau comes ‘Wings,’ a charming, creamy white taffeta dress with wings over the shoulders and flaring godets around the bottom that give a quaint, petticoated look. Don’t miss the garnet belt and the circlet of garnets in the hair. Glittering stars and circlets reflect the light on many smooth heads in Paris these days.” — R. S. in Delineator, August 1933. 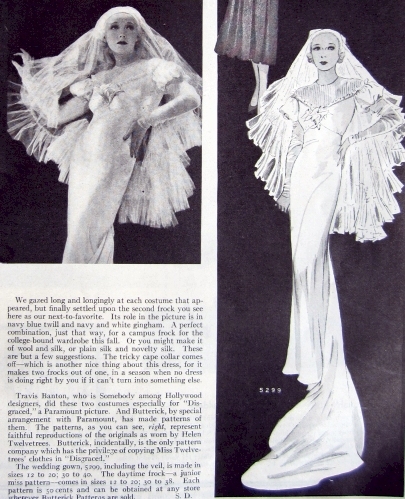 Apparently, if you tired of the Letty Lynton ruffles, you could wear the dress without its “fichu.” I wasn’t able to find a picture of it without the fichu, unfortunately, although this illustration from the 1933 catalog shows the fichu/capelet and sleeves made of a different fabric than the dress. Of course, hats were needed for a church ceremony, but the velvet hats illustrated here look like streetwear in surprisingly dark shades. Perhaps they’re a penny-pinching nod to Depression Era budgets. 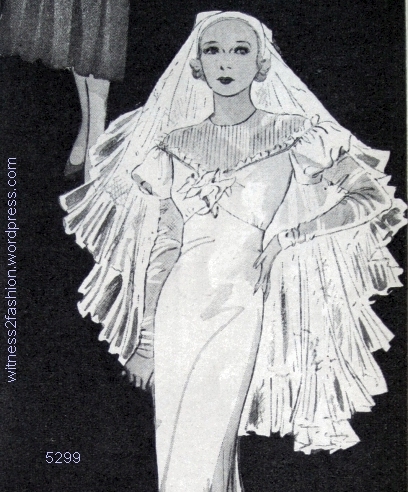 Hats for the Bridal party in a Church Wedding; Delineator, 1933. Very odd. 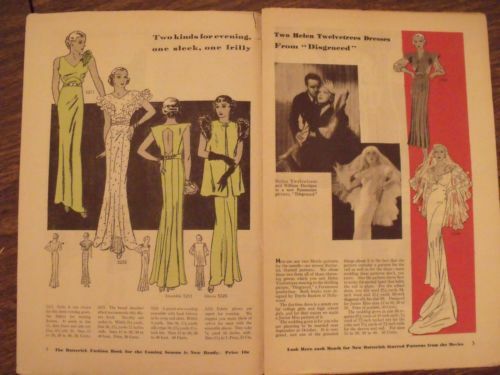 The movie-linked patterns issued by Butterick in May of 1933 were designed by Howard Greer, for the movie Christopher Strong. Hepburn played an aviatrix in love with a married man, British MP Christopher Strong, and Helen Chandler played his daughter, Monica Strong. 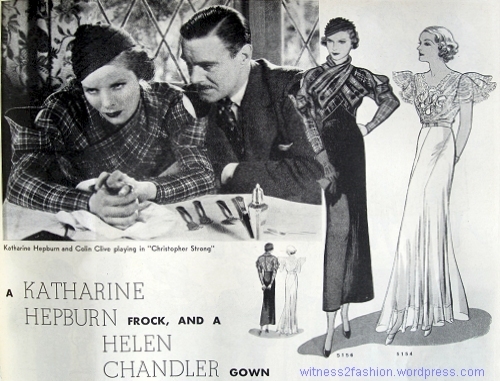 Katharine Hepburn and Helen Chandler wearing Howard’s Greer’s designs, copied as Butterick Starred Patterns. Delineator, May 1933. This was only Katharine Hepburn’s second movie. Helen Chandler, a successful stage actress, is probably best remembered in films as a victim of Bela Lugosi’s Dracula (1931), although she appeared in over two dozen movies. Her later life was a sad one. 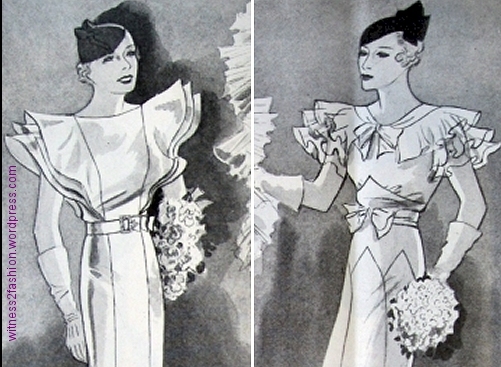 Butterick Starred Patterns 5156 and 5154, from Delineator, May 1933. 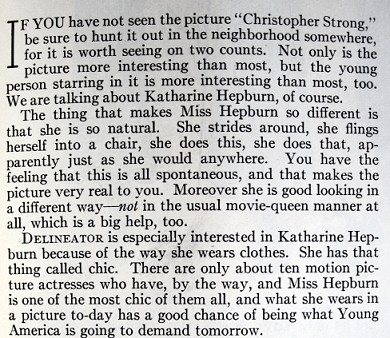 “Delineator is especially interested in Katharine Hepburn because of the way she wears clothes. She has that thing called chic…. What she wears in a picture to-day has a good chance of being what Young America is going to demand tomorrow.” By 1933, fashion magazines like Delineator were beginning to appreciate that movie costumes might have more influence on young women’s clothing choices than Paris fashions. 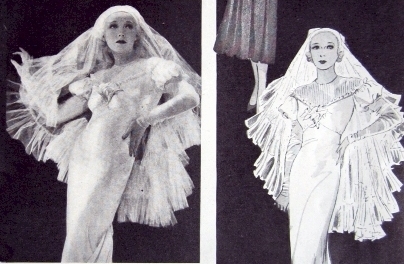 (The “Letty Lynton dress”of 1932 had created a great demand for copies.) 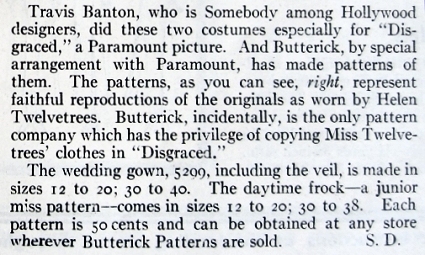 Butterick entered into agreements with three studios — Warner Bros., R.K.O., and Paramount — which allowed Butterick to make exact copies of dresses worn in their movies. This was quite different from the Hollywood Pattern Company’s approach. However, for whatever reason, only a few of these Butterick Starred Patterns were ever issued. This one, designed for Katharine Hepburn by Howard Greer, was Butterick 5156. It included a pattern for the tucked hat. 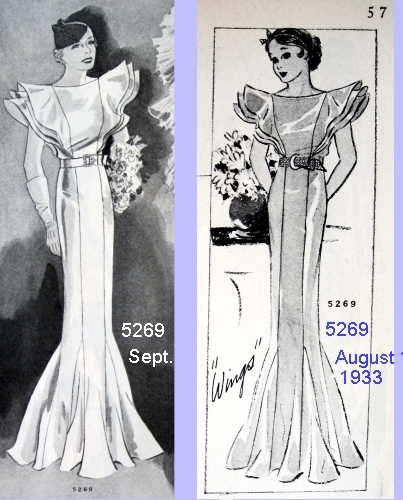 The open sleeves were seen on other dresses in the 1930’s. You can see the pattern envelope, with alternate views, by clicking here. Butterick Starred Pattern 5156 from May, 1933. Delineator. 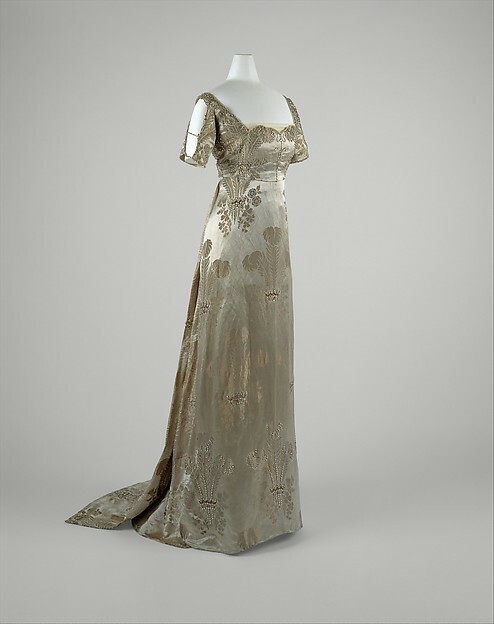 Helen Chandler’s gown, No. 5154, was made of organdy — like the Letty Lynton dress — and trimmed with lace. Butterick Starred Pattern 5154 was designed for Helen Chandler by Howard Greer. Delineator, May 1933. The “lace is sewed along one edge only;” i.e., it is not labor-intensive insertion lace. A variation of this evening pattern, made in plaid organdy, was illustrated two months later, in the July issue of Delineator. There was no mention of its movie connection. 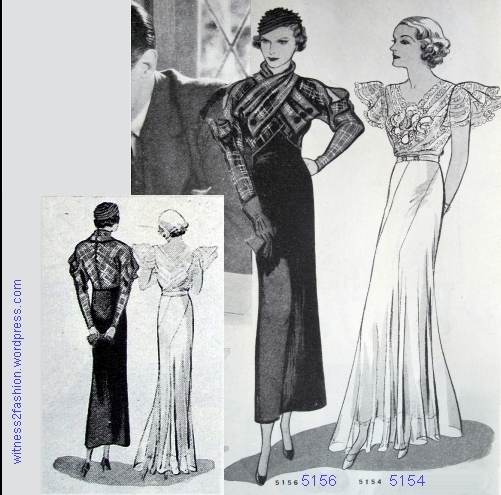 Details of Butterick 5156 and 5154, May 1933. You can see the Starred Pattern envelope for Butterick 5154 at the Commercial Pattern Archive; Click here. 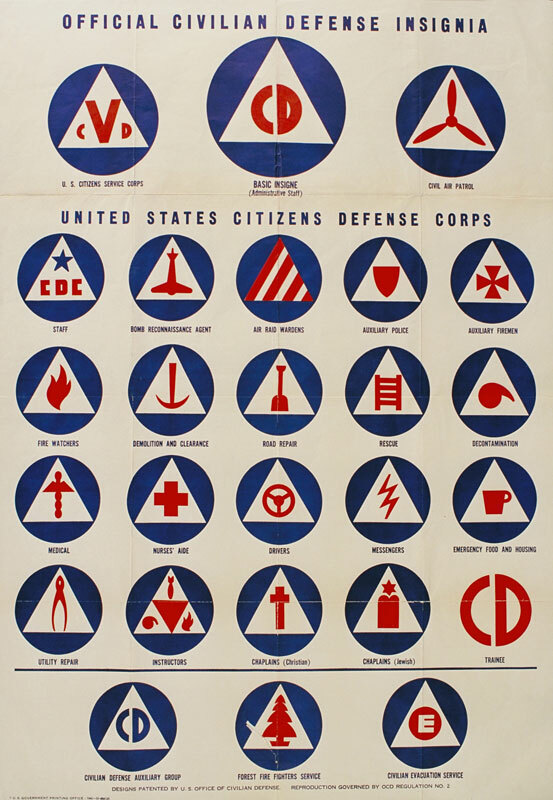 Designer Howard Greer had been working in the movies since the 1920’s. Jay Jorgenson and Donald L. Scoggins, authors of Creating the Illusion, put their chapter about him in the Silent Era. For a while, he was head of the wardrobe department at Paramount Studios, but he said he did his best work in three dimensions, while his friend and associateTravis Banton had a genius for what would look good on the screen. In 1927, Greer left Paramount to start his own custom clothing salon in Los Angeles. Many of his clients were movie stars. He obviously moved back and forth between his work for private clients and his film costume design, usually only designing gowns for the star. 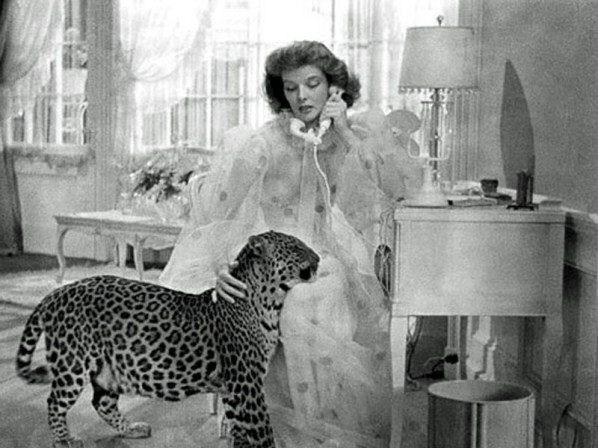 One of his later films was Bringing Up Baby, also with Katharine Hepburn. In the 1940’s, he started a ready-to-wear business. His last film credit was lingerie for Joan Crawford in Sudden Fear (1952). 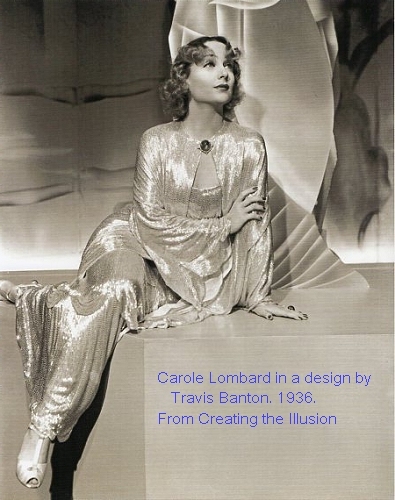 He was also a mentor to Edith Head, giving her her first job at Paramount Studios. 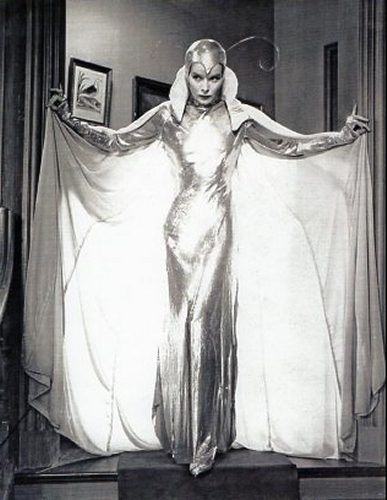 Katharine Hepburn in Christopher Strong, wearing a Moth Costume by Howard Greer. From Creating the Illusion. TCM has a great 2 minute video that shows her making an entrance in it — Wait for it! “Forgive me if I keep staring at you,” says Colin Clive. No kidding. This is Part Four of a Series about Butterick Starred Patterns. Part 1, Part 2, and Part 3 were patterns based on designs by Orry-Kelly, for Warner Brothers movies.